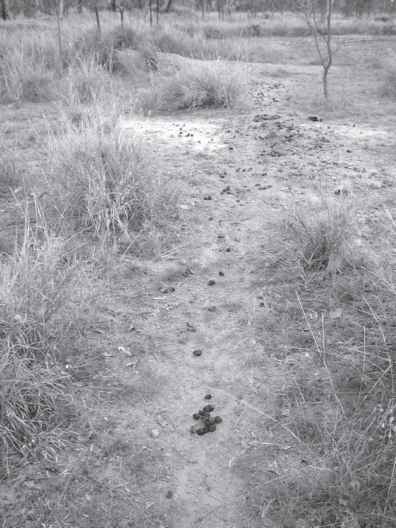 Soon after leaving the vicinity of the burrow, the wombat usually deposits the first of the many heaps of scats it will produce during the night. In bare-nosed wombats, where and how they are deposited depend on the wombat's age. An immature animal - one less than two years old - will generally seek cover in a patch of ferns or similar undergrowth where it will stand still with the small tail slightly raised and the eyes half-closed while it neatly drops the characteristic pile of cube-shaped scats. A mature animal usually chooses a rock, a stone, a stick, the raised edge of the road or some similar elevation as the site for its scats. 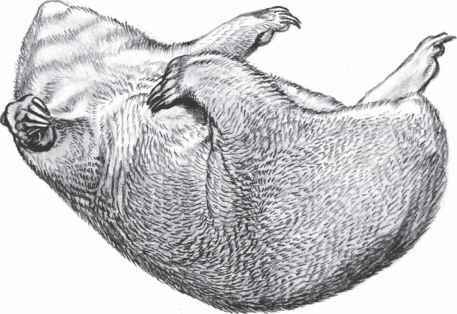 It will back up to this elevation, and a male wombat will almost invariably make two or three long slow scratches on the ground in front of it, first with one front paw and then with the other, while it deposits its scats. A female bare-nosed wombat often chooses an elevated position for her scats, but usually only scores the ground with her forepaws when she is angry or aroused in some other way. 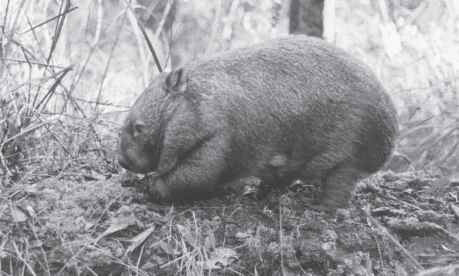 Hairy-nosed wombats deposit most of their scats at latrine sites and these are used by many wombats. They are often found at popular scratching posts (Figure 5.7). They do not appear to favour raised surfaces as the bare-nosed wombats do. lyre-birds, digging echidnas or gardening humans, and they almost invariably deposit a pile of scats on the freshly dug ground.